We had bunches of kids this year – here they are in the order of their arrival! Oreo begat Tino (buck) & Tina (doe) 2/14 My first set of twins! Cocoa begat Pepper (doe) 4/30 Got to the farm & there was Pepper! Chausette begat Gizmo (doe) 5/25 Another surprise birth. Brownie begat Deuce (buck) 6/11 One minute Brownies pregnant, the next, she’s not! Blacky begat Sammi (buck) & Sadie (doe) 6/22 Second set of twins for her! 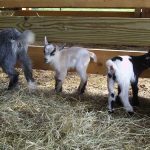 Noel begat Puck (buck), Tessa & Terra (does) 6/24 First set of triplets, no help needed! Molly begat Muffin (buck) 7/3 Uneventful birth! Total count 7 bucks & 7 does! 50/50 NOT BAD!! Most are sold – I’m keeping Herman & Deuce as future herd sires. Muffin is unique as his mom is a full blooded registered Tennessee Fainting goat with a 6 on the fainting scale. However Muffin doesn’t faint.. at all. So he’s just going to be a big pygmy mix. Oh well. As for the does, I’ve only kept Pepper & PeeWee. Next breeding isn’t until the end of September & by then I’ll have 14 does ready to breed that should all kid during the month of February. At that time, Pepper & PeeWee will be ready to breed & that will bring more kids for the end of July. Herman & Deuce have their work cut out for them! Ziggy the Zebu is doing well… he’s turned out to be just an expensive lawn ornament. He’s a good guy, very loving and friendly (to me only), except if I have a rope in my hand. He will not come anywhere near me if he thinks I’m going to try to catch him. Otherwise he’s one big puppy dog! He loves to lick me (must be the salty sweat)… picture a 6 inch long cat tongue… that’s what his tongue is like and when he licks, trust me, it doesn’t feel good! But he’s fat & happy and that’s all that matters. He’s my only critter that doesn’t have a buddy. 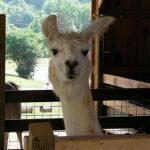 The 3 amigo Llamas are doing fine. Stormy is the boss, followed by Major. Big Al is definitely the follower even if he’s much bigger than the 2 others. All 3 are very patient with the kids and let them jump all over them. Now if I can only get Major to use the common dung pile and stop pooping in the barn area! 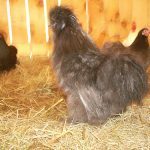 Dr. Seuss the Silkie rooster has 2 buddies – 2 white Silkies. We’ve yet to determine if they’re hens or roosters but all three hang together & god forbid they’d mingle with the “commoners”! As for the rest of the chickens (Bantam Cochins), I have 3 hens & one rooster left from the original 25 that I bought but we have about 15 chicks running around the farm. One of our ducks sat on a clutch of eggs for about 40 days. Finally 6 little ducklings emerged! One egg had been rolled aside but I gently peeled the shell and released the little duckling. I kept it under a heat lamp for a day and then brought it back to mom who gladly accepted it. Sadly, we had a snapping turtle in the pond that killed 5 of the ducklings within 5 days. We’ve since captured the evil critter and it was humanely disposed. Only 2 ducklings survived, one being the little one that I rescued. The other 4 ducks are like aunts & uncles to the little ones.. they always travel in a group and they are so cute to watch! I pity anyone or anything that tries to get near the little ones.. mom is ferocious! Lulu & Grumpy the Pot Belly Pigs are getting old together. Although he’s friendly, he’s always grumbling and bears many scars from trying to befriend old Lulu. They each have their own Dogloo and old blanket and they get along long enough to eat from the same big pan but that’s as close as they’re going to get to each other. They didn’t have the Dogloos this past winter and so they did snuggle together in the shed – but that was to conserve their heat… no love there – maybe from Grumpy but certainly not from Lulu. Latté the crippled bunny manages to get around just fine! Also found out that her buddy the Lionhead is a little buck – not a doe like I originally thought. She’s got a nesting box but I don’t know if Lionhead’s been able to breed her… she’s at least twice as big as he is. Flopsy & Fluffy have another litter of week only bunnies… only 3 this time and I hope to have more does to keep than I did from the last litter in March. My peacocks flew away from the farm earlier this summer. Mr. P left first and Mrs. P disappeared a few days later. My neighbor about half a mile away through the woods had Mr. P in her chicken coop one day but he didn’t stick around long enough for me to go catch him. I hope they have a nice life together in the woods and that they didn’t get eaten by something. Madigan & Daisy June the miniature donkeys are always a joy to be around. Of course Maddy’s the boss & DJ just tags along. We discovered th at Maddy loves to be saddled & ridden but DJ will have nothing of it. To this day it’s very hard to separate them. DJ will heehaw non-stop if I take Maddy away from her. I’m in the process of training all my minis to operate a pony carousel for rides… Maddy does really well & I think is very content to be away from her constant shadow! Our next project is to get a little Jack here for a month to breed these two. They’re quite ready but am I? We’ll see! 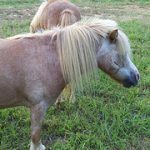 A month or so ago we opened up a new field/pasture for the miniature horses. They’re now on the back part of our property and have about 7 acres of fenced pasture to run around it. They absolutely love it! Toffee (my first mini), turned a year old in June and is a stunning little filly. Old Blue is still fat & gentle and may be pregnant. I drove her several times early in the summer and she does well but doesn’t care to run too much. She breathes very heavily all the time and although I know she’s healthy, it bothers me to hear her breathe like that. I’ll have the vet come by in the near future to perform an ultra-sound to confirm if she’s pregnant or not. Buddy has also filled in and is a beautiful gelding. He enjoys being ridden but doesn’t do too well pulling a cart. He has only one speed & that’s slow… very slow! My lovely Coquette is still a bit cautious and very protective of her adorable little Buttons. She only tolerates Toffee around her and will turn and kick any of the others that come too close. it’s time to wean so I moved Buttons to the goat area for a while and that should help Coquette with her protection issues. Buttons is not alone, she’s with her good friend Toffee. I’ve driven Coquette only once & I think we were doing good but I got a flat on my cart & wasn’t able to ride at all! She too should be pregnant… we’ll have her checked out also. Our dogs, Sheba the German Shepard is getting older & shedding like crazy… Taz the Chihuahua is enjoying life and staying out of Sheba’s way… Angel the pound hound is fat and still always looking for food and Mandy the mixed Min Pin, well Mandy is still a weird ugly little dog. As for Sola the Siamese cat, she’s still the queen & Minou the Siamese wannabee hunts all night and sleeps in a box somewhere in the shop all day. Our Fila Brazilieros, Diesel & Beulah continue to enjoy being the house guard dogs. 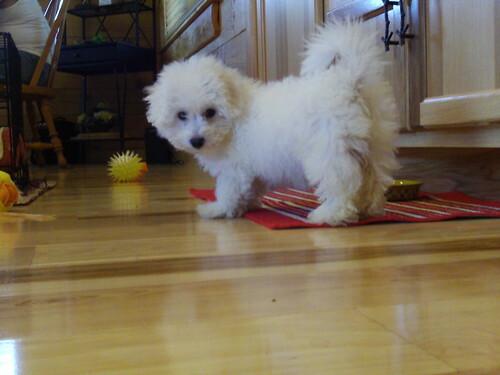 They’re always on patrol and now have something else to watch out for… Mouse, our fearless 5 lbs Bichon Frisé puppy! Mouse just loves to hang out with the big dogs and has absolutely no fear of them. She respects them but they have no clue what to do with her. I’m not sure they even realize she’s one of them! Either one of them could easily & quickly make an appetizer out of her but they’ve accepted her quite well. As long as she stays out of Diesel’s dog house, they’re okay! I think I’m now up to date with what’s been going on here these last few months. My current project (if the weather can cool down some), is training Madigan, Old Blue, Buddy & Coquette to work together on the carousel. There are a few events coming that I’d love to offer pony rides. But we’ll have to see how this goes – I can’t risk hurting anyone with an animal that’s not ready. I also want to work with Coquette and my little cart. I think she’ll do well.. we just need to work on it! So there you go my friends! Stay in touch!